May 22, 2015, 1:45 p.m.
Kentucky Senator and Republican 2016 hopeful Rand Paul became one of the latest prominent Republicans to back the idea of a &apos;flat tax&apos;. Under the current tax regime, the amount of tax paid for each dollar of income increases as someone&apos;s income grows higher. The highest tax rate, 39.6%, currently hits all individual income over $413,200 a year. Under a flat tax there would only be one tax rate, meaning that over the standard deduction, every dollar of income would be taxed at the same rate. Under Rand Paul&apos;s plan the tax rate could drop to as low as 15%. Research from YouGov shows that, in principle, many Americans support the idea of a flat tax. 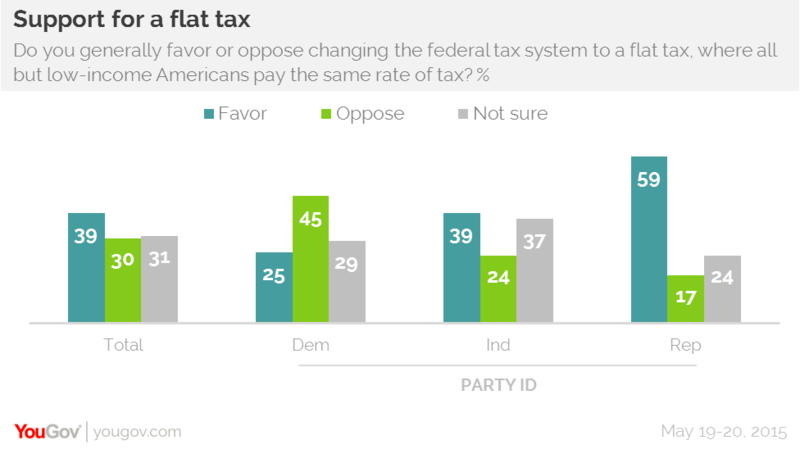 39% of Americans say that they would support a flat tax, 30% oppose it and 31% aren&apos;t sure. Democrats (45%) tend to oppose the plan, while most Republicans (59%) and many independents (39%) support it. When asked about specific flat tax rates, support tends to drop and opposition increase. Asked about a 19% rate for all but low-income Americans, 31% support it while 41% oppose it. This is essentially the same as in November 2011, when 28% supported a 19% flat tax rate and 39% opposed it. Support and opposition are more evenly matched with a 15% rate, such as the one Rand Paul is considering, with 34% of Americans in favor of it and 36% opposed. One of the major consequences of a flat tax would be that the amount of income tax paid by the highest earners would drop significantly. When Americans are asked what impact this would have on their attitude towards a flat tax, 48% say that it would make them more opposed to it. Half of the American public also think that the current federal income tax system, where higher incomes are taxed at higher rates, is fair. Only 29% think that it is unfair. 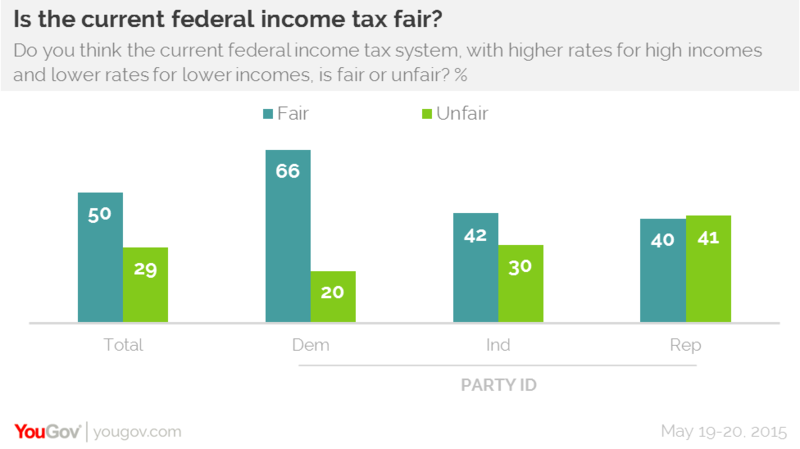 Republicans, however, are evenly split between those who think that progressive taxation is fair (40%) and unfair (41%). Two-thirds of Democrats (66%) and many independents (42%) think that the current system is fair.